The Income Tax department has issued a Rs 24,646-crore tax demand notice to Sahara Group’s Aamby Valley Limited after conducting a special audit of the company. The department, as part of a special investigation and audit into the account books of AVL, found that an income of over Rs 48,000 crore for a particular assessment year was allegedly not reflected in the record books of the firm and hence it raised a fresh tax demand and penalty amount on it. A Sahara Group spokesperson confirmed the development to PTI. ‘Yes, the Income Tax Department has raised Rs 48,085.79 crores to the income of the Aamby Valley Limited with a total demand of income tax of Rs 24,646.96 crores on the Aamby Valley Limited,’ the spokesperson said in a brief statement. Officials said the notice was issued by the taxman in January this year after the special audit of AVL’s income for the Assessment Year 2012-13 found that the parent firm had allegedly floated a clutch of Special Purpose Vehicles whose incomes were later accounted on the account of AVL as they were merged with the former in due course of time. The AVL, in its income return filed for AY 2012-13, had reflected a loss of few crores but the special I-T audit brought up the added income, a senior official said. 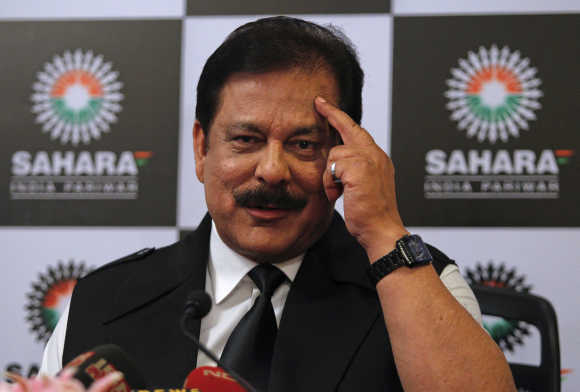 The Supreme Court, last week, had asked the Bombay high court's official liquidator to sell the Rs 34,000 crore worth of properties of Aamby Valley owned by the Sahara Group and directed its chief Subrata Roy to personally appear before it on April 28. “Enough is enough. You cannot say something today and resile tomorrow,” a bench, comprising Justices Dipak Misra, Ranjan Gogoi and A K Sikri, had said, taking strong note of non-submission of over Rs 5,000 crore by the Sahara Group. The bench also cautioned Roy from playing with the court’s order and said non compliance of its order would invite the wrath of the law and ultimately he will be at his own peril.